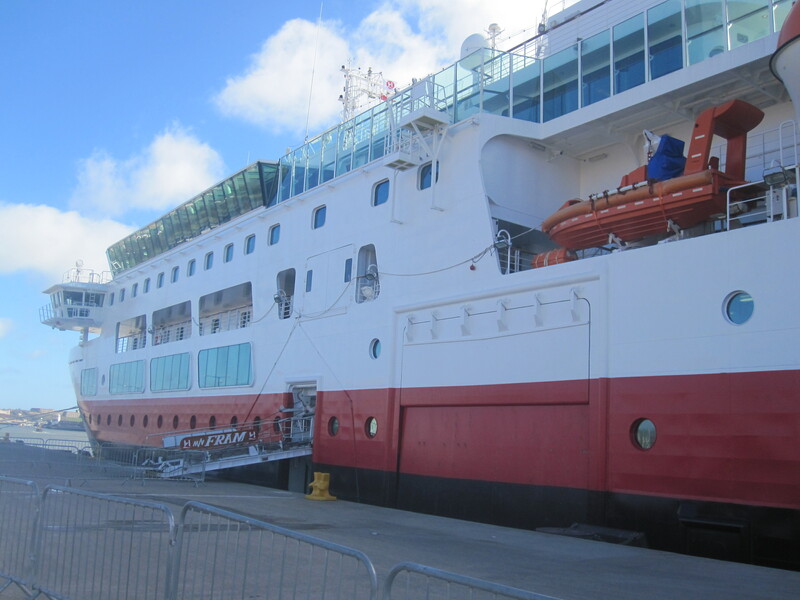 Yesterday I enjoyed the hospitality of Hurtigruten ship, MS Fram, whilst she was docked in Port of Tyne. That was once I found her of course. I knew she was small but as we drove towards the terminal I couldn’t see anything that resembled a ship. Finally she peeked out from behind the apartment building that sits directly in front of the dock and I could breathe a sigh of relief. For a split second I thought I had gotten my dates mixed up. At 11,647 GT and room on board for just 318 passengers MS Fram may well be small but she is the perfect sized explorer vessel in my eyes. The chief purser introduced himself and said if I needed anything to make my way back to the front desk where they would assist me, otherwise I was free to explore as I wished. Perfect! I do like guided ship tours but sometimes especially on a vessel this size it’s nice to just break free and explore how you wish and at your own pace. On deck 4 you could find the front desk and a rather pleasant seating area. The space was open but the seating was arranged in such a manner as to make it feel like you had your own square living room. 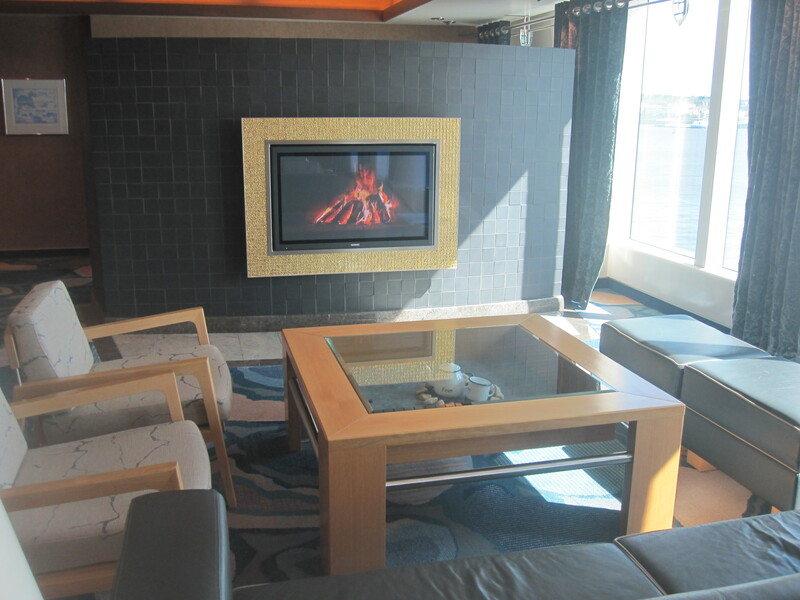 One of the sections even had a TV imitating a burning fire on the wall which created a lovely feel. Only to be outshined by the floor to ceiling windows and an unspoilt view across the ocean. To the left there was a bistro, small shop and buffet area and to the right a small internet section and some function rooms. As I turned and made my way back out and along to the other end of the ship I found myself in the Imaq Dining Room. This was right at the aft end of the ship and offered beautiful panoramic views. The tables were prepared and there stood a large buffet station in the centre of the room. I was told they do buffet dining and waiter service in here, it varies per evening. Next I made my way towards deck 7. The first door I came across was the one that led directly into the gym. I made my way in and was actually greeted by a space larger than I had anticipated. It was still small of course but it felt generous. There was more than enough equipment in there to keep fitness enthusiasts happy including two or three treadmills. Three exercise bikes, ping pong table, weights and a rowing machine. 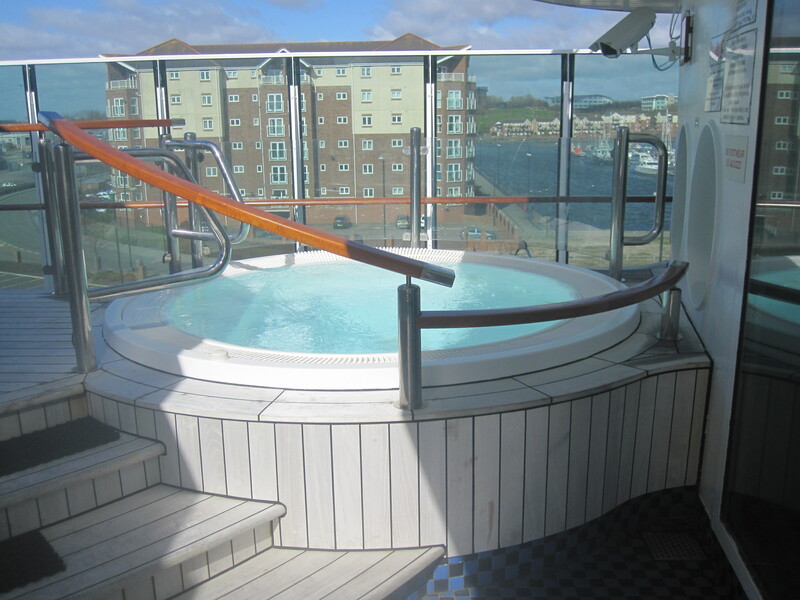 The door at the back led out onto a small decked area which was home to two bubbling hot tubs. I continued outside and found a pleasant sun deck at her aft with numerous tables and chairs and to my surprise two huge chimney BBQ’s. After snapping a few pictures I went up one deck to check out the view from the observation deck. I can only imagine what cruising through the Polar Regions on this ship must be like. It truly is designed for exploring and not missing a thing, rarely is your view obstructed from anywhere on board. Now it was time to view some cabins. I entered number 539, the Thorvald Nilsen cabin, and what a cabin it was. The bathroom was one of the nicest I have seen on any cruise ship. The room and bathroom were fitted with a dark wood yet the light from the huge window helped to not make the room feel small because of it. There was a large wardrobe space and then a small seating area with TV. This clearly was a high grade of cabin. I did view another, an inside and the décor contrast was very different. The inside cabin however was still very spacious and comfortable. About as wide as you would expect an inside cabin to be but, it did feel quite long in comparison to other inside cabins I have looked around. My visit to MS Fram was something different, after all she is an expedition ship built to explore not entertain with numerous bars, clubs and lounges. She was very modern and every crew member I had the pleasure of passing greeted me with a genuine smile and a hearty hello. I chatted with a few of her passengers, all seemed very happy and one couple said it was their 4th time on the ship so they clearly enjoy what she has to offer. She left me hoping I too one day can experience an expedition voyage, in that sense I suppose she done her job! She also left me wondering what evenings on board are like. I have said many times I don’t need to have entertainment around the clock, I am happy to just sit and chat and as MS Fram had no real entertainment venues on board it would be interesting to see how people spend their evenings. Great article about your visit to MS Fram! I have had the opportunity to visit her before and although she may be small, she certainly has her very own unique character!